The best SaaS marketing teams create custom content calendars to strategically attract and nurture prospects all 12 months of the year. Whether your B2B tech company operates on a fiscal or a calendar schedule – don’t start your year without this important framework. Brainstorming and mapping out 12 months’ worth of brand awareness, educational and promotional communications is a daunting task. When sitting down to create an annual content calendar, where do you even begin? 67% of the buyer’s journey is now done digitally (SiriusDecisions). As a result, tech marketing teams must generate high volumes of content – from thought leadership byline articles to social media ads – to reach buyers at the right place, at the right time and through the right channel. 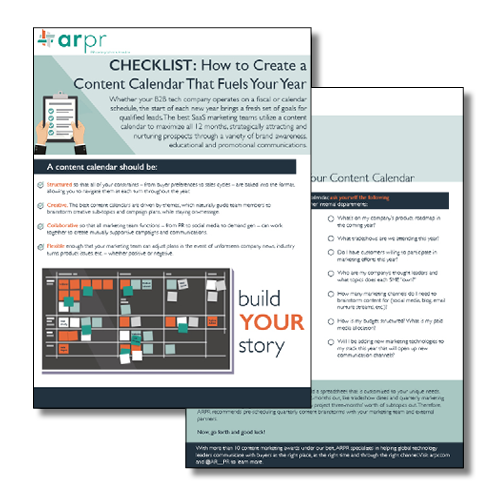 With so much content to produce, a cross-functional calendar is a must. As one of the nation’s fastest growing technology PR firms, ARPR is a results-driven public relations and integrated communications agency helping global leaders and growth-stage technology brands #MakeNews and #DriveLeads.